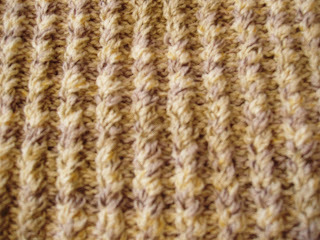 This pattern is from the May '09 issue of Let's Knit. I used James C Brett Firenze DK yarn which I got as in a sale. The sleeves are three quarter length and it's has a yoke neck. I love the twisted rib, even though there seem to be lots of it, lol. My favourite bit is the flower brooch used to fasten the shoulder. They are so simple to make, but so effective. 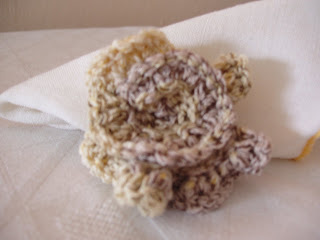 I'm going to make more of these in different colours and add seed beads. There is a pattern for a short sleeved cardigan in the same magazine that I'd like to do. I need to go and see if I can find some cotton DK for that one. Next one to finish is D's jumper. Beautiful work. I like the twisted rib and the little flower also. It's a nice neutral color. It's beautiful! 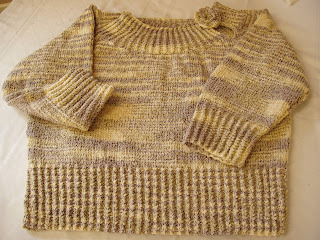 I love the striping of the yarn and the twisted rib. I really need to branch out from socks and get brave enough to try a sweater. That's a lovely one. I love the flower brooch. ohhhh, I like the color! I love the adorable flower brooch. Just the perfect finishing touch. Like your cards also. I like this - a lovely shape and the rib looks great - and the flower just sets it off nicely! It's lovely. The colour is gorgeous and I can see why you like the little flower so much! Lovely, the little flower adds so much to it. Great job, as usual!